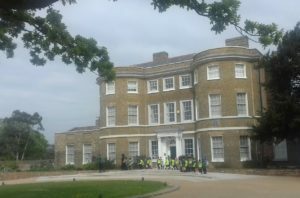 So to a small, but perfectly formed, North East London museum, the William Morris Gallery in Water House, Walthamstow (closest Underground station, Walthamstow Central, Victoria Line, see directions on web-site ). The gallery, re-opened in 2012 after extensive refurbishment is FREE to enter, open Wednesday to Sunday and definitely worth a visit. On the day we visited there were a number of school parties, mostly small children, of whom more later. Water House itself is a beautiful Georgian building, Morris’s home in his teenage years, but then Morris lived in a succession of beautiful buildings, the most famous being Phillip Webb’s The Red House and, later, Kelmscott Manor. Ever mindful of his own good fortune Morris saw beauty as something to be shared in by all, not just the wealthy and led him to try to provide some small aspects of it, through his design and manufacturing company Morris & Co, at reasonably affordable prices. 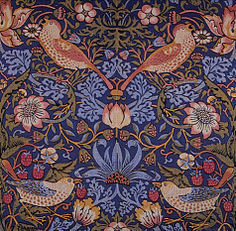 There must be few people in the first world who have not seen some aspect of Morris’s designs for fabric, wall-paper and tapestry, so ubiquitous have they become. Even though the company closed down, the patterns are a staple of interior design companies, used to decorate everything from cutlery to men’s ties. Strawberry Thief (left) is one of the most enduring, though Willow, Acanthus and Hyacinth are also still very widely reproduced. Though there is so much more to Morris than designing patterns. His poetry and late fantasy novels ( which influenced C.S. Lewis and J.R.R.Tolkein ); his exquisite type-setting, book illustration and printing at the Kelmscott Press. Not only the setting up of the Society for the Protection of Ancient Buildings in 1877 (now very much seen along side that of the National Trust and other institutions similarly beloved by the bourgeoisie), but also the creation of the Socialist League (Morris was a genuine radical, influenced by Marx, who was arrested and fined several times for protesting on the streets ). Morris seems to have got more angry and radical as he got older. 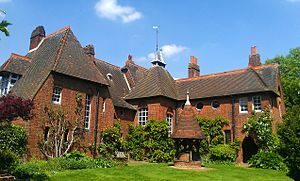 The Museum covers all aspects of his remarkably productive life (including the anti-police posters), his family and friends like Edward Burne-Jones, some of whose works can also be found there. 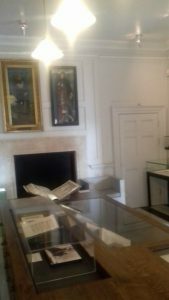 A facsimile copy of the Kelmscott Chaucer and of the Kelmscott Shakespeare are available to leaf through. There is much that is inter-active, especially for children. 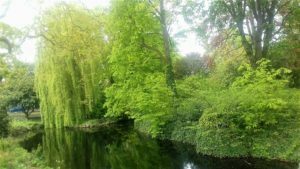 We were astonished and charmed, on our visit, to come across an entire roomful of under tens carefully creating ‘Morris’ patterns in absolute silence and concentration. The building also contains paintings and sculptures by other artists. Sir Frank Brangwyn, who worked in Morris’ workshops, has several rooms to himself, including the current exhibition ‘Sheer Pleasure‘ an exploration of Brangwyn’s relationship with Japanese art. There are also the works of artists working today – there was a fascinating film about making Japanese woodblock prints and some examples of the resulting works on display. A full programme of events can be found on the web-site. There is a reasonably priced cafe and, outside the original grounds of the house are now a very pleasant public park. An informative, inspiring way to spend a morning or an afternoon. This entry was posted in Art, Culture Vulture, History, London and tagged History, London, Worth a visit by juliej. Bookmark the permalink.